IRCTC formal announcement on Aadhaar Card as mandatory for booking online tickets. Since few years it has been a speculating issue on weather Aadhaar Card should be mandatory document for booking online tickets. Officials from IRCTC had made formal announcement regarding this issue stating that Aadhaar card is a must for booking tickets online. As per Press Trust of India, special software is being developed by Railway Officials. This new software will help passengers in attaching their Aadhaar Card. What would be the procedure to link Aadhaar Card? There have been many rumors around internet, that lead everyone to believe that linking Aadhaar Card would be continuous process and one has to link their Aadhaar Card every time they book tickets. Thinking that it might lead to unnecessary delays. But that was just a rumor after all. As per Press Trust of India, Aadhaar Card linking is though mandatory is a one time registration. Customers just have to link their Aadhaar Card with their IRCTC Account and that's it. On booking online tickets Aadhaar Card linked to IRCTC Account will also link to tickets booked. During ticket checking above linked Aadhaar Card would cross checked for authenticity. This surely reduce the burden. What is the reason behind linking Aadhaar Card to Rail Tickets? There has been a lot problems with unauthorized agents. These unauthorized agents would book tickets in advances using offline and online modes. These agents then would contract with the passengers those who are in urgency and would sell them tickets at higher rates, earning a commission for themselves. Also these agent would transfer the blame to IRCTC and Railways officials, as some passengers who brought tickets might think that these agents are getting tickets from officials through some unauthorized ways. Once the process of linking Aadhaar Cards comes into action all those agents will get flushed away, leading a pathway of genuine transactions. 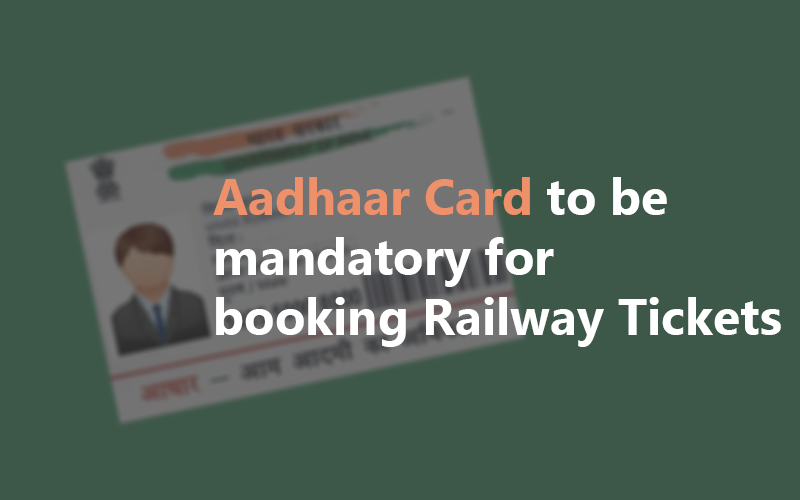 Officials from Railways has said that " Aadhaar Number will be required for one time registration at IRCTC. This step is aimed at removing touts from registering with fake identities". Pilot Project will start from 1st April, which is aimed at providing discount for eligible senior citizens. Senior Citizens can avail these discounted rates with linking of their Aadhaar Cards. The discount facilities are available both in online and offline mode. Indian Railways is in motion to install 6000 plus PoS (Point of Sale) machines across all railway bookings counters for cashless ticket bookings, and 1000 automatic ticketing machines. Aadhaar Card being mandatory helps in achieving authenticity among ticket buyers. It also helps officials in identifying fakers.